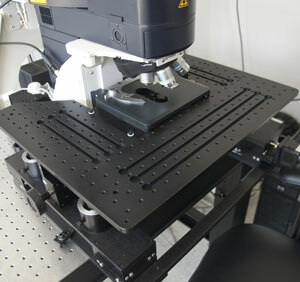 This microscope was configured to enable high sensitivity vital imaging. This intent is apparent in the detectors available, the DODT gradient contrast method, the scanning mechanisms, the stage, the objectives available, and the accessory equipment. 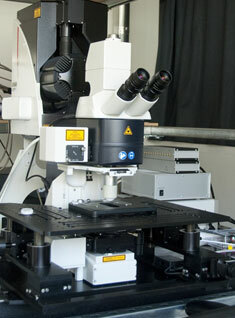 The microscope is equipped with a pair of non-descan detectors (NDDs) for reflected light and a pair of substage NDDs. These substage detectors, used in combination with the reflected light detectors, provide, if your specimen is transparent, an increased ability to detect any emitted fluorescence. In addition the microscope has a substage detector that can be used for transmitted light and is equipped for DODT gradient contrast. Finally, the microscope has a PMT for reflected light that, like the confocal, is located behind a prism enabling the bandwidth and range of wavelengths detected by this PMT to be precisely controlled. This microscope has two different scanning mechanisms: a galvo-based scanner like that on the confocal whose scan rate can achieve up to five 512 X 512 frames per second, and a resonant scanner capable of thirty 512 X 512 frames per second . The resonant scanning provides detection of dynamic fluorescence events, even those that occur in different parts of the field of view. The stage on this microscope is identical to that on the confocal. It provides for maximum flexibility in the types of specimens accommodated. There is a standard, manual x-y stage with slide holder, but this can be substituted with a solid platform that would accommodate a small animal or a investigator-designed and constructed platform that accommodates any variety of dishes/tissue holders. This stage can be manually lowered/raised so that a variety of thicknesses of specimens can be placed under the microscope objectives. Lastly, the stage has x-y motors so the x-y position can be controlled from the software. The microscope is commonly operated with a one position nosepiece. A special $25K dipping objective (20X 1.0 NA 2 mm working distance) is available for trained users, but the microscope can be operated with either of the two nosepieces available for the confocal and any of the lenses listed in the description of the confocal. The accessory equipment available for the 2 photon is the same as that on the confocal: a heated CO(2) incubator around the stage, a thermistor-controlled in-line heater for perfusion fluids, and a heated stage. The microscope is equipped for standard, widefield epi-fluorescence, including filter cubes for TRITC, FITC, and DAPI.